He celebrated his main victory with all Soviet people. The day of victory against German-fascist occupants, victory, which he was hardly approaching in the battle-front as well, as in the home front. A great sportsman, citizen and patriot Leonid Meshkov – our story is about those unforgettable years. Leonid Meshkov came into the world the first day 1916. A future star of Soviet sport born in a small village on the bank of a Great Russian river Volga, in a family of simple peasants. Local boys were spending all their spare time on the water and on the river’s sandbanks. They were fishing, diving with any tire, swimming one after another as a ”frog” and in overarm, playing tag. Native inhabitants named them respectfully “Volgars”. Well-built, nature has showered Herculean force on him, young Leonid Meshkov more than once was a winner in those swimming’s catch up races in Volga. And he was not even thinking about big and glorious victories, which would make him famous all over the World. Graduated from 7 classes’ school in his native village, a provincial fellow challenged a destiny and entered in a stock-taking calculation technical college in Stalingrad, where under supervision of its teacher of physical culture I.A. Stepanov he started to learn rudiments of crawl and butterfly strokes. “Volgar” was catching all on the fly and from his first competitions he demonstrated rather high results for a beginner, always being in the “prizes”, what was immediately noticed by experts. In the fall 1936, not without their assistance, a perspective swimmer removed to Leningrad and started to train in a water-sporting club “Dauphin” with a well-known at this time coach G.P. Chernov. And it was really a fantastic collaboration! Could you imagine, that as result of their joint hard team-work in a pre-war period Leonid Meshkov renewed more than 50 records of USSR, Europe and World (! ), although the latest were considered as “non-official”, because in those glorious time Workers’ and Peasants’ Soviet Union rejected any participation in so called “bourgeois” sporting organisations, including, alas, the International swimming federation. And besides, he was the first Soviet swimmer, who surmounted 100 m in crawl faster than one minute, a symbolic mark for all swimmers, with the result of 59,4! An “eternal” World record of American fivefold Olympic champion Johnny Weissmuller, future star of Hollywood, a legendary Tarzan (57,4) was already looked as not so inaccessible. Combining his own training, studies in Lesgaft’s Institute of physical culture and a work of coach, in March 1940 Meshkov set a recurrent World record for the distance of 400 m in butterfly – 5 min 41 sec. And the same year he received for his outstanding sporting achievements, one of the first in Soviet Union, an esteemed title of Honoured sports’ master of USSR. The Great Patriotic war stopped this brilliant sport’s career which was only rising. As other famous Soviets sportsmen Meshkov might receive “armed” privilege and to stay in the home front, continuing to improve his sporting mastery and giving it to others. But as a real patriot, maximalist in sport and live, he chooses another way. Already an hour after an announcement of official radio newsreader Levitan about war’s beginning 22nd June 1941 he arrived to Communist party’s committee of “Electrosila” plant, where after studies in training school he was working as a couch, and requested to be sent as volunteer to a battle-front. Remarkable physique of Meshkov, his nice sporting preparation, persistence and a real champion’s pressure produced a big effect to the plant’s party members and as a replay to his demand, without any delay, they enlisted a swimmer-volunteer in a 78th reconnaissance company of the first infantry regiment of the 2nd division of People volunteers military forces, which was after sent to fight in Luga’s direction. Leonid Meshkov like this remembered those heroic days: “We went again to recon through a Luga river, but we run into a minefield. We must go away, but mines were surrounding us. No earth, no water around, it was only abyss, as “in the first day of creation”. A splinter of exploded mine broke an arm of my friend Serguei Kulakov, also a swimmer. I picked him up, entered in the water and there, among tough mines’ howl and black columns of explosions I was injured in two arms. So already I had no forces to hold Serguei and he felt, being quasi breathless. I bended forward to him: “Hold on, as you can, to my neck, let’s swim!” And we were swimming! Mines were bursting near us, everything around was boiling… Ah, Luga, Luga, I was swimming a lot before, but I could never know that I needed to swim thousands of kilometres in order to traverse such a narrow river in a very difficult moment”. Received some injures in his arms and in a heart’s area, Meshkov by miracle got out from the water and fainted. He was picked up by aid-men and immediately sent in an emergency plane to Leningrad, where doctors were making all their possible in order to save life of a glorious sportsman. But to promise him, that he will swim again, and more, participate in competitions, nobody could. After there were several operations, including on his heart, and a lingering medical treatment and finally a long-awaited recovery. Thanks to his invincible will-power, courage and robust health, Leonid Meshkov was able again “to enter in the water”. But it was not the end of the war for him. Together with other famous swimmers as Klavdya Aleshina, Vladimir Kitaev and Simeon Bochenko they were sent to Soviet Army as instructors to preparer fighting swimmers. The order of High command was a preparation of not less than 1000 soldiers by every instructor. There were very strong conditions, but Meshkov and his combat friends-sportsmen executed it with honour till the end of the war. At the same time Meshkov continued to train in the water. In accordance with his own method in a very short time he had restored not only his force, but he also came back to big-time sport, although in his heart will forever stay a splinter of that luckless mine, which doctors finally decided not to perturb. 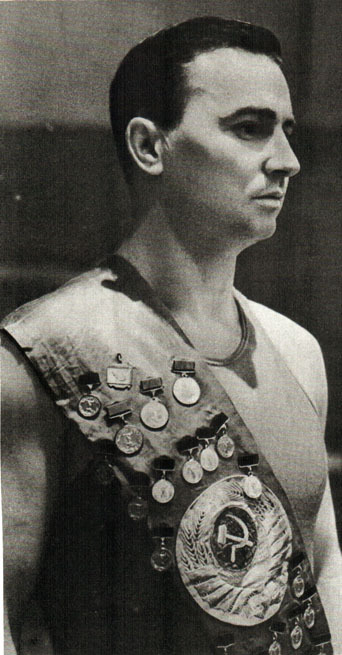 In 1946 Meshkov moved to Moscow, where he entered in Stalin state’s institute of physical culture and sport, continuing his active participation in competitions. In concurrence with his permanent and implacable rival Simeon Boichenko, “king of butterfly”, as he was named by European press after his triumphal pre-war tourney, they set alternately more and more new records. In spite of both sportsmen in every way avoided a direct personal concurrence in their favourite distances, nevertheless they were obliged many times to battle each other for his sport-club and their champion’s status at the same competitions: Championships of Moscow, USSR and other internal and international tournaments. As a result of such uncompromising struggle, by their joint efforts, many World records were raised up to such high level, that till the end of this epic confrontation and of their brilliant sporting career those results remain inaccessible for foreign swimmers, as unsubdued Leningrad and Moscow for Wehrmacht troops during the war! So, their best World’s results in 100 m and 200 m butterfly were 1,05,4 & 2,29,8 for Boichenko and 1,05,1 & 2,33,1 for Meshkov. For those fantastic at that time achievements sportsmen were named by Western press “Russians titans of butterfly”. 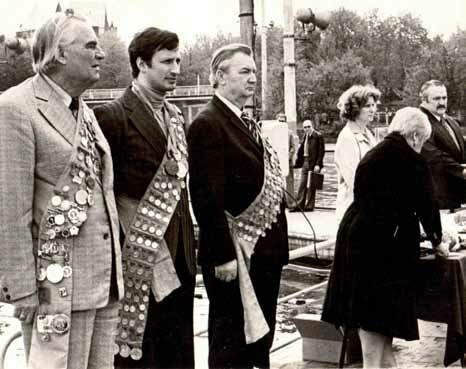 And after entry in 1948 of USSR Federation of swimming into International Federation of swimming (FINA) Leonid Meshkov renewed five times more World records and became the first Soviet swimmer who was recognized as an official World record holder. But at the end of 1948 the rivalry of two great Soviet swimmers was suddenly stopped. By a false accusation Simeon Boichenko, before a pet of Soviet public and personally of “great chief of all peoples, a best friend of Soviet sportsmen”, was arrested. He was accused for so called “bourgeois” propaganda and calumny against Stalin’s son Vasily and he quickly sent to GULAG in Solikamsk. The same fate shared, alas, a lot of well-known Soviet sportsmen, as brothers Starostin, founding fathers of a famous football team “Spartak” (Moscow). The almighty Stalin’s Moloch of repressions spared Meshkov. Probably, its role had played his heroic war past, serious wound, State’s decorations and party’s membership. But who knows now? Meanwhile, Leonid Meshkov continued to compete and to win, practically without any equal rivals to him in Soviet swimming pools. 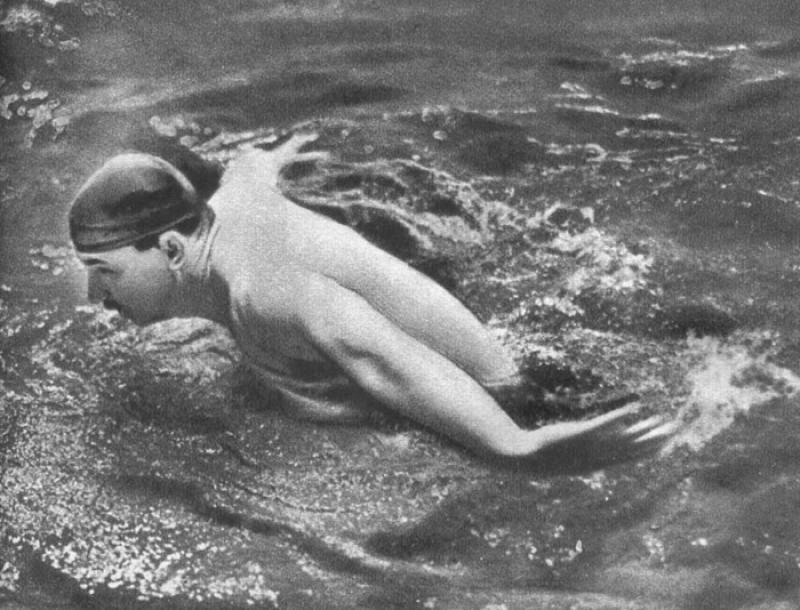 In all, during his long-standing sporting career from 1932 till 1952 he established more than 120 records of USSR and Europe, among them 14 were the best results in the World, he became 42 times champion of Soviet Union in swimming and once in 1948 a champion of USSR in water polo with “Torpedo” (Moscow). Three years after he participated in a legendary series of matches against Hungary, a strongest team of this time. At the end of his brilliant career he participated in XV Olympic Games in Helsinki (first Olympiad for Soviet sportsmen), being there as a real father for most of swimmers by his age and life experience. After that Meshkov decisively passed on training and scholastic work. In 1953-1955 he was a manager of Soviet national team in swimming and from 1952 more than 30 years he leaded a sporting department of Lomonosov Moscow State University (MGU). He joined the Angels 4th March 1984. As sign of gratitude and eternal appreciation of his outstanding achievements in sport and in pedagogical science, a well-known by all Moscow’s swimmers a University’s “quarter” — twenty-fifth meters’ swimming pool, situated in the basement of imperial main building of MGU on Sparrows’ hills, from now is bearing his glorious name. Many different, great and modest, sporting victories fall to his lot, but as remember men and women, who had a chance to contact him, the main victory of his life forever was this one, a common victory, celebrated with great joy and tears by all Soviet people 9th May 1945. Victory, for the sake of which a Great Russian swimmer Leonid Meshkov shed his blood.